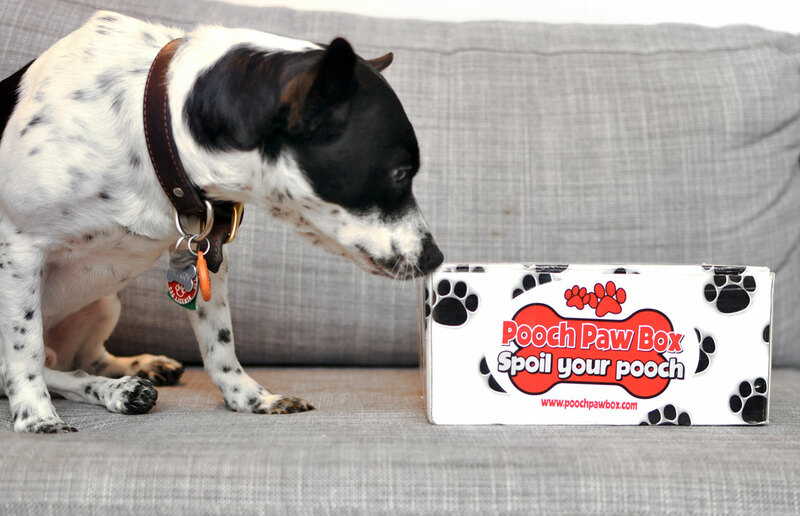 You may remember Pooch Paw Box from our post about dog subscription boxes. I mentioned that it costs $20-25 a box, that all treats are made in the USA, and that Pooch Paw Ma hand-picks the contents of every box. 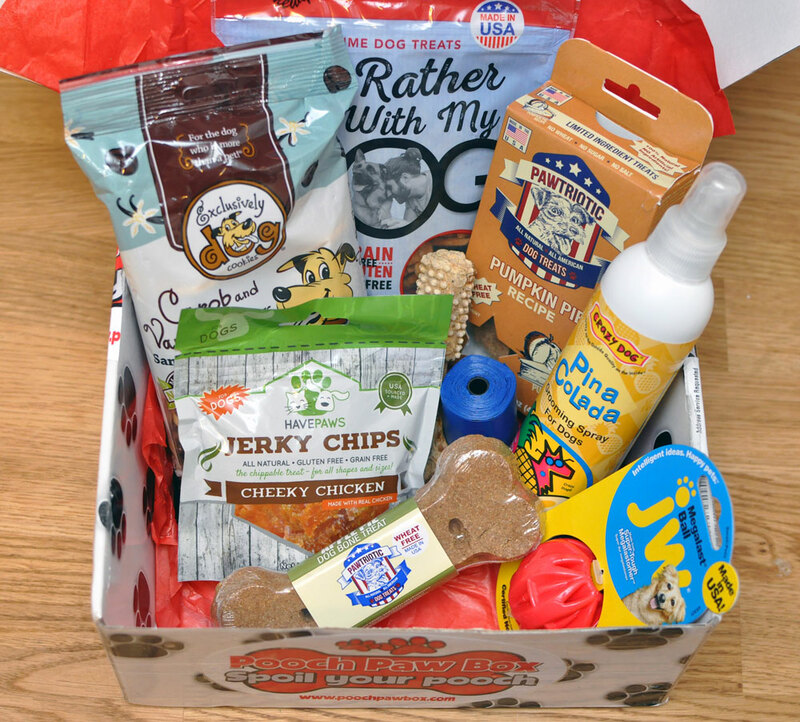 Pooch Paw Ma (Tina Hannaford) herself saw the post, and offered to send Henry a box to try! I eagerly accepted: the personal nature of the service and the fact that every item (not just treats!) in the box is made in the United States really appealed to me. We recently received our box, and I am so excited to show you what was inside! Henry couldn’t stop sniffing the box! Before we look inside the Pooch Paw Box, I’d like to show you the outside. I’ve never seen such a cute box! The paw print pattern is adorable and Pooch Paw Ma even wrote “Attn: Henry!” on a sticker. When I picked it up, I was shocked by how heavy it was; I knew it must have been STUFFED with goodies. I was right! The website advertises that each Pooch Paw Box is filled with 4-5 items, but my box was filled with nine different items! Not every product was full-sized, but I like that Henry will be able to try many different treats and toys that he hadn’t before. Look at all of the goodies! 1.) 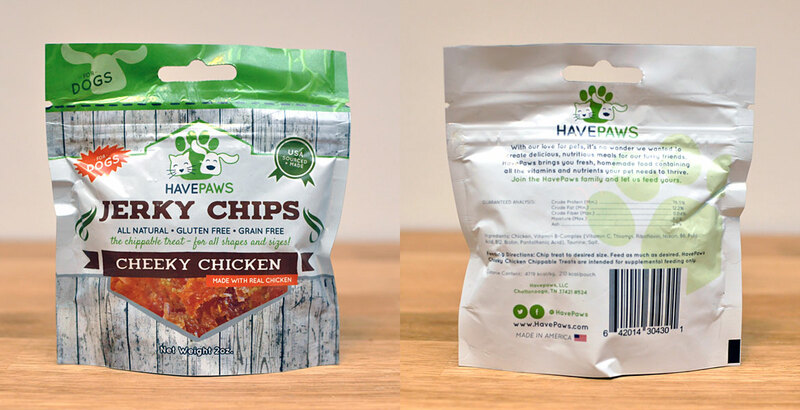 Have Paws Jerky Chips Cheeky Chicken Flavor, 2oz. 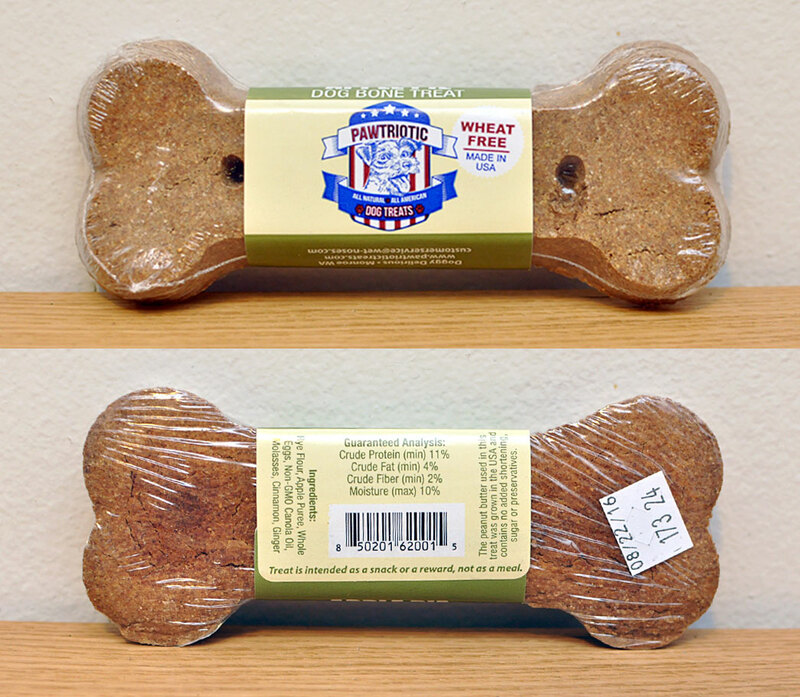 These treats are designed to chip off into any size piece, which will be perfect for the training Henry and I do on walks. 2.) 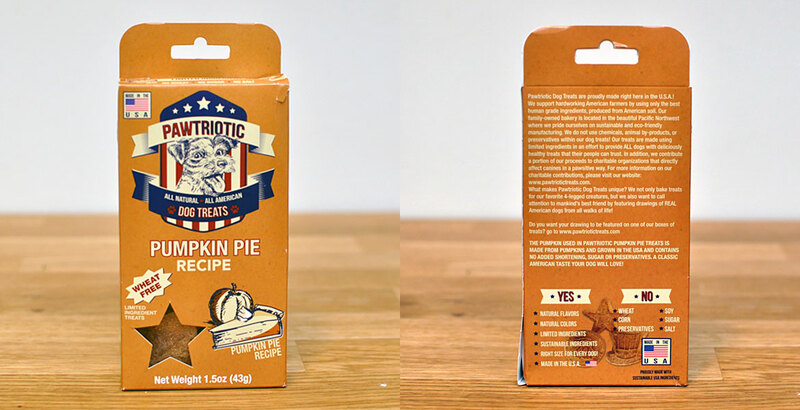 Pawtriotic Pumpkin Pie Treats, 1.5oz box. I had never heard of this company, and I love the flavor! I feed pumpkin to Henry regularly, so I know he’ll love these. They’re also made of human-grade ingredients, which is a huge plus. I love this company’s flavors! 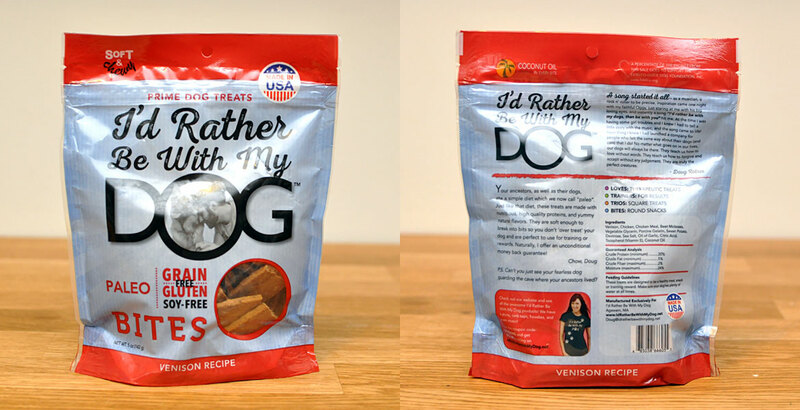 Another treat made in the USA with human-grade ingredients that I know Henry will love. Henry loves balls and has recently taken to chewing his toys. This will be perfect! 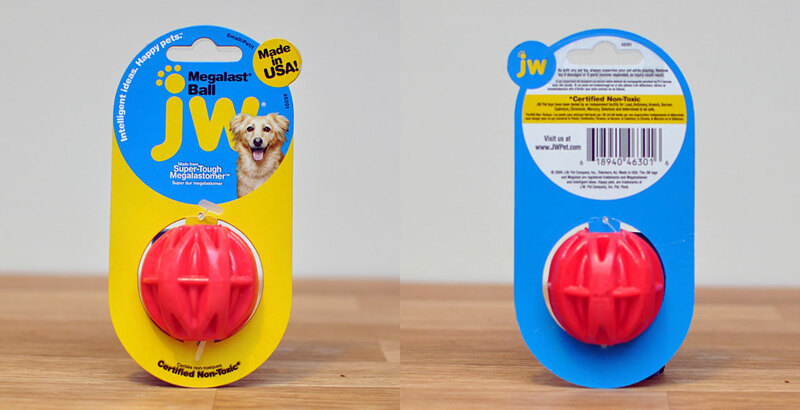 It’s also a small size, which is perfect for his little terrier mouth. I can tell Pooch Paw Ma picked this item especially for Henry! 5.) 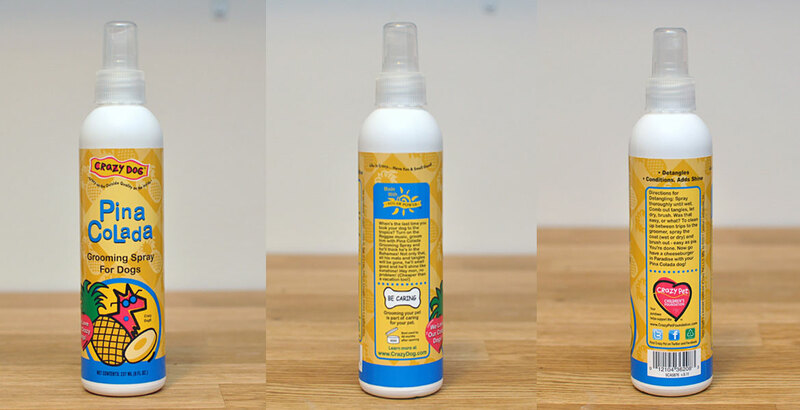 Crazy Dog Pina Colada Grooming Spray, 8oz. This spray smells like vacation! One of my coworkers absolutely loved the scent; my boyfriend had mixed feelings. We’ll see have to see what Henry thinks! I think it seems like a great product to keep Henry smelling fresh between baths. 6.) I’d Rather Be With My Dog Paleo Bites, Venison Recipe, 5oz. I’m excited about these! I love to have a variety of treat flavors on hand to keep Henry interested during training, and he’s never tried venison! I’m familiar with the brand, but I’ve never tried their treats. 7.) 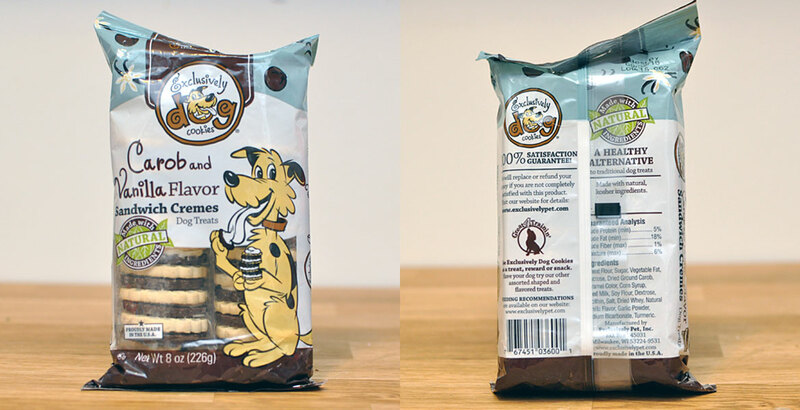 Exclusively Dog Cookies, Carob and Vanilla Sandwich Cremes, 8oz. These look DELICIOUS, and I’m going to have to keep reminding myself that they’re for Henry. This is a BRILLIANT idea! 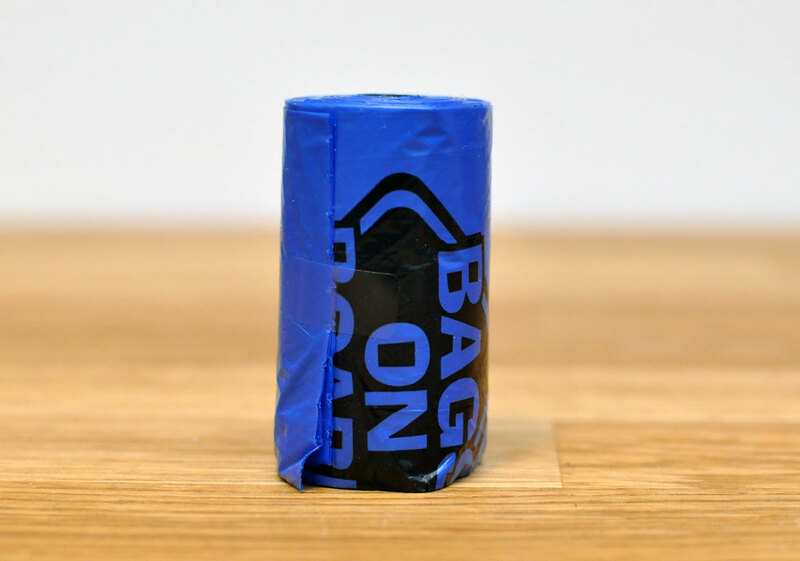 Many dog owners use waste disposal bags (the more technical term, but I prefer “poop bags.”); I know that I go through several rolls a month. I think it is a wonderful idea to have these in a subscription box service, and it’s a perfect item to have on hand in case you run out. Two thumbs up! Henry was VERY excited about this item! He grabbed it and ran off to his protected “bone spot” to start chewing. 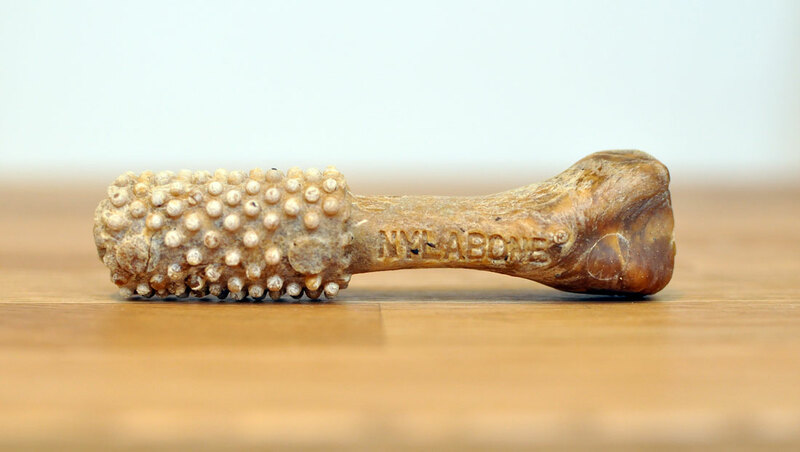 I was very impressed with the contents of my Pooch Paw Box. I discovered several new brands that I had never heard of, and am thrilled that everything is made in the USA. The price for this service is very reasonable compared to other dog subscription boxes and it was exciting to try so many different items. 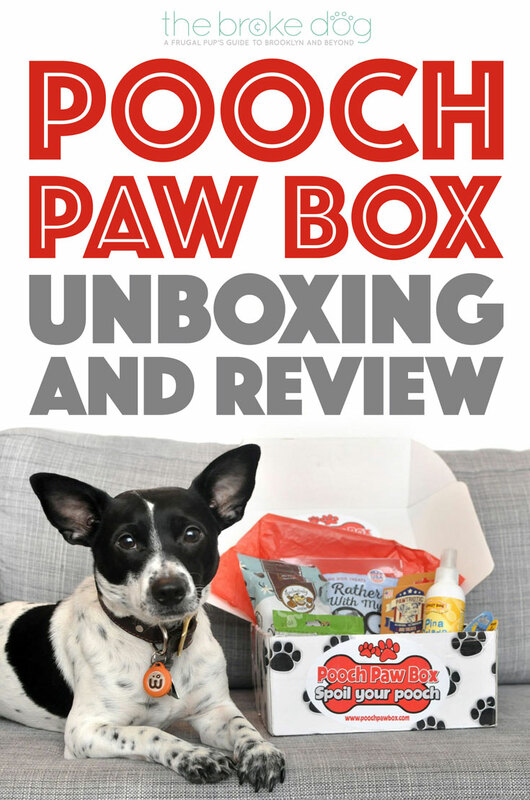 Based off of the box that I received, I highly recommend Pooch Paw Box! Thoughts: A great service for dog owners who prefer USA-made products and a more affordable subscription box! Rating: Four out of Four Paws! Learn about other dog subscription box services in our Dog Subscription Boxes: How to Save and Have Fun post! Rochelle BaRoss is an accessory designer by day and a blogger, entrepreneur, and dog mom by night. She moved to Brooklyn in 2012 without a paying job, signed a lease on a two-bedroom apartment with five other people, and worked hard and saved for years until she could move into her own studio apartment and adopt Henry, her terrier mix. Giveaway Time: Steven the Subaru’s First Anniversary + Why We Love Subaru! Unless otherwise stated, all content & photographs are © The Broke Dog. If you wish to use any of my content, please contact me. Also, The Broke Dog contains paid advertising & affiliate links. Please read my Disclosure and Disclaimer page as well as the Terms of Service page for more details.